I used to be obsessed with oats for breakfast. Granola with milk or yogurt, quick oat porridge, oat muffins, etc. It is whole grains and healthy, gives you energy in the morning, yeah! Oats may contain gluten though so if you are gluten-sensitive like me, you need to look for gluten-free oats. 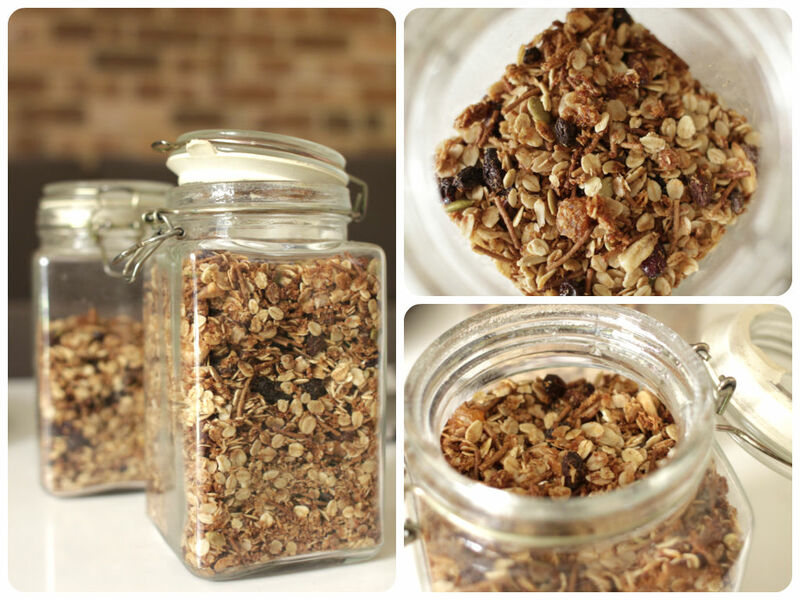 Granola is baked rolled oats cereal with nuts and dried fruits. My hubby has a bowl of granola with milk for breakfast, and I normally pick on it when I feel like snacking during the day (Yes, I have been getting my hands on his jar during the day. Sorry Daniel!). Store-bought granola can be loaded with sugar and oil. It is best to make your granola at home to limit the amount of sugar and fat contents. Or look for low-fat granola if you choose to buy from the shops. 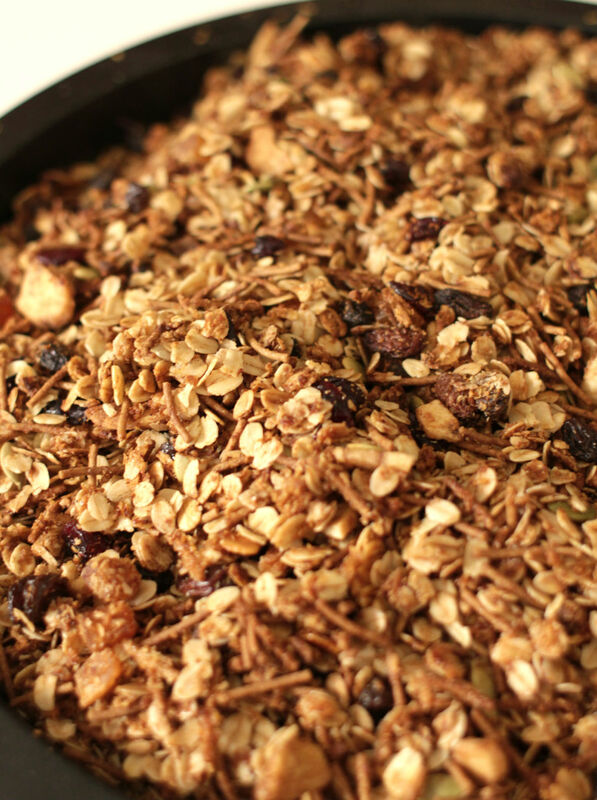 Granola has a number of health benefits – fibre, healthy fats, vitamins and minerals. Main ingredients of granola, oats, bran and nuts, contain a good amount of fibre which helps to regulate digestion and prevent constipation. It also controls your blood sugar level and keeps you feel full longer. Good fats from nuts, seeds and coconut oil helps to lower cholesterol, blood pressure and reduce inflammation. Omega-3 fatty acids, a type of polyunsaturated fatty acid, in granola are essential for proper brain function. Granola also contains vitamin E which acts as antioxidant, thiamin and folate which helps energy metabolism and nerve function. Essential minerals such as magnesium, phosphorus, zinc, copper, manganese and selenium are also found in granola. The recipe is so versatile. You can pretty much add any of your favorite nuts, seeds and dried fruits in the home made granola. Easy, and way cheaper than the store bought kinds! In a large mixing bowl, mix together the oats, coconut and wheat bran. Add the wet ingredients in a saucepan over medium heat and stir well. Add the wet mixture (while still warm) to the dry mixture and stir making sure that all of the dry ingredients are fully coated with the wet ingredients. Spread onto a pan lined with baking paper and bake in the oven (180) for 45 minutes. Remove the pan from oven every 10 minutes and stir for even baking and crispiness. Cool granola before pouring into a bowl and adding dried fruits. It will crisp up as it cools.